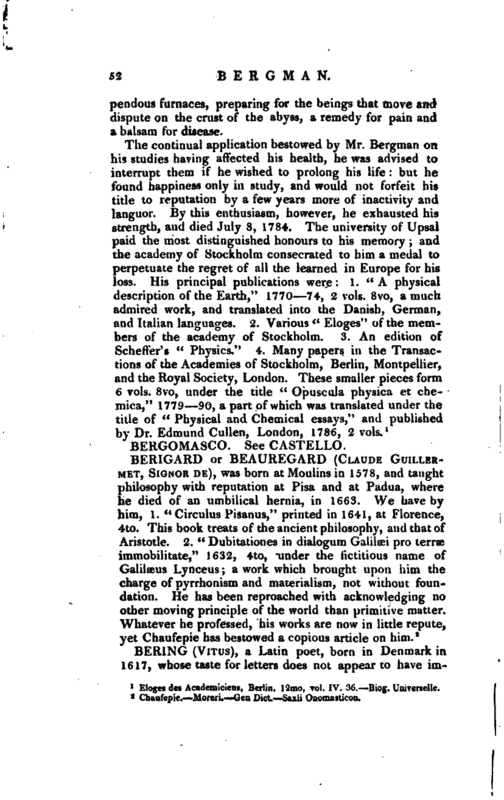 , a celebrated chemist and natural philosopher, was born March 20, 1735, at Catharineberg in Westgothland. His father was receiver-gene^ ral of the finances, and had destined him to the same employment but nature had designed him for the sciences, to which he had an irresistible inclination from his earliest years. His first studies were confined to mathematics and physics, and all efforts that were made to divert him from | science having proved ineffectual, he was sent to Upsal with permission to follow the bet of his inclination. 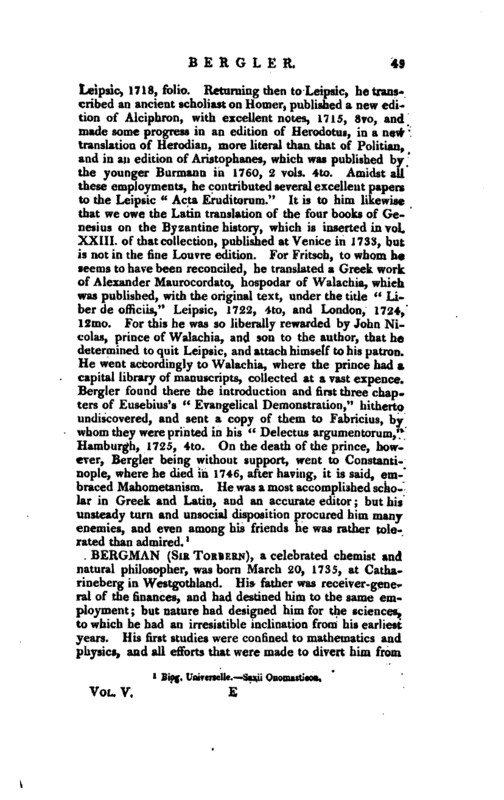 Linnaeus at that time filled the whole kingdom with his fame. Instigated by his example, the Swedish youth flocked around him; and accomplished disciples leaving his school, carried the name and the system of their master to the most distant parts of the globe. Bergman, struck with the splendour of this renown, attached himself to the man whose merit had procured it, and by whom he was very soon distinguished. He applied himself at first to the study of insects, and made several ingenious researches into their history; among others into that of the genus of tenthredo, so often and so cruelly preyed on by the larvae of the ichneumons, that nestle in their bowels and devour them. He discovered that the leech is oviparous, and that the coccus aquaticus is the egg of this animal, from whence issue ten or twelve young. Linnæus, who had at first denied this fact, was struck with astonishment when he saw it proved. “Vidi et obstupui” were the words he pronounced, and which he wrote at the foot of the memoir when he gave it his sanction. 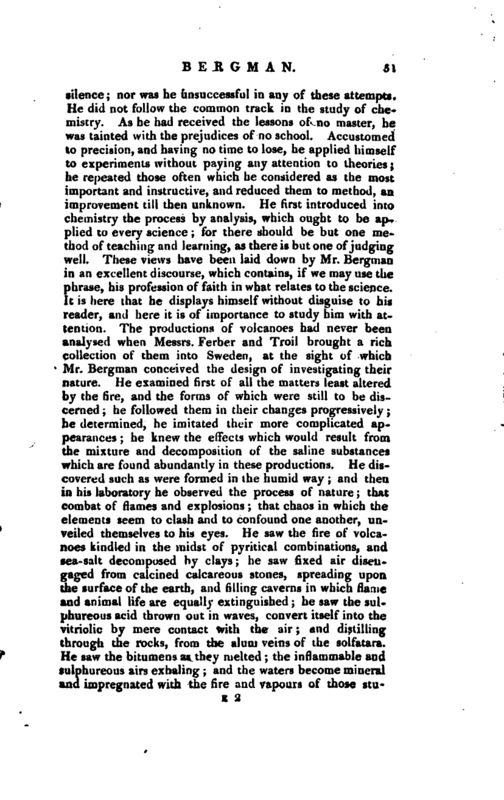 Mr. Bergman soon distinguished himself as an astronomer, naturalist, and geometrician; but these are not the titles by which he acquired his fame. 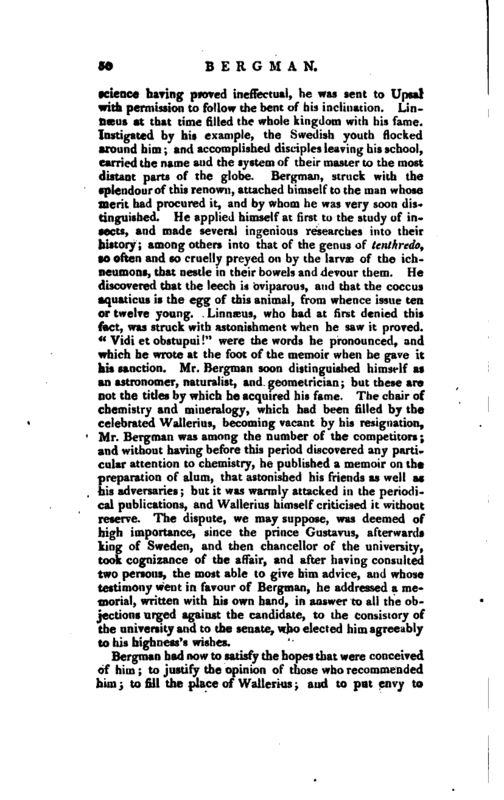 The chair of chemistry and mineralogy, which had been filled by the celebrated Wallerius, becoming vacant by his resignation, Mr. Bergman was among the number of the competitors and without having before this period discovered any particular attention to chemistry, he published a memoir on the preparation of alum, that astonished his friends as well av his adversaries but it was warmly attacked in the periodi­^cal publications, and Wallerius himself criticised it without reserve. The dispute, we may suppose, was deemed of high importance, since the prince Gustavus, afterwards king of Sweden, and then chancellor of the university, took cognizance of the affair, and after having consulted two persons, the most able to give him advice, and whose testimony went in favour of Bergman, he addressed a memorial, written with his own hand, in answer to all the objections urged against the candidate, to the consistory of the university and to the senate, who elected him agreeably to his highness’s wishes. Bergman had now to satisfy the hopes that were conceived of him to justify the opinion of those who recommended him to fill the place of Wallerius uud to put ecivy to | silence; nor was he unsuccessful in any of these attempts. He did not follow the common track in the study of chemistry. As he had received the lessons of no master, he was tainted with the prejudices of no school. Accustomed to precision, and having no time to lose, he applied himself to experiments without paying any attention to theories; he repeated those often which he considered as the most important and instructive, and reduced them to method, an improvement till then unknown. He first introduced into chemistry the process by analysis, which ought to be applied to every science for there should be but one method of teaching and learning, as there is but one of judging well. These views have been laid down by Mr. Bergman in an excellent discourse, which contains, if we may use the phrase, his profession of faith in what relates to the science. It is here that he displays himself without disguise to his reader, and here it is of importance to study him with attention. The productions of volcanoes had never been analysed when Messrs. Ferber and Troil brought a rich collection of them into Sweden, at the sight of which Mr. Bergman conceived the design of investigating their nature. He examined first of all the matters least altered by the fire, and the forms of which were still to be discerned he followed them in their changes progressively; he determined, he imitated their more complicated appearances he knew the effects which would result from the mixture and decomposition of the saline substances whick are found abundantly in these productions. He discovered such as were formed in the humid way and then in his laboratory he observed the process of nature that combat of flames and explosions that chaos in which the Clements seem to clash and to confound one another, unveiled themselves to his eyes. He saw the fire of volcanoes kindled in the midst of pyritical combinations, and sea-salt decomposed by clays he saw fixed air disengaged from calcined calcareous stones, spreading upon the snrface of the earth, and filling caverns in which flame and animal life are equally extinguished he saw the sulphureous acid thrown out in waves, convert itself into the vitriolic by mere contact with the air and distillinothrough the rocks, from the alum veins of the solfatara. He saw the bitumens as they melted the inflammable and sulphureous airs exhaling and the waters become mineral and impregnated with the fire and vapours of those stu2 | pendous furnaces, preparing for the beings that move and dispute on the crust of the abyss, a remedy for pain and a balsam for disease. Floges des Academicians, Berlin, 12mo, vol. IV. 36. Biog. Universelle.